It's amazing how a family situation can change so quickly, or at least it seems to be quick, but in fact this change has been many years in the making. 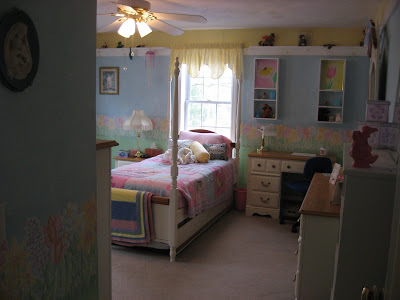 When we moved to this house eleven years ago, all the walls were white and I decorated each room, one at a time, as time and money allowed. 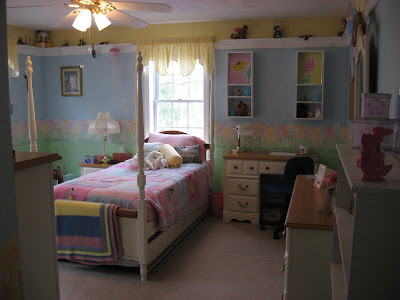 Our older daughter's bedroom was the second room I added color to and that was during the summer of 2001. 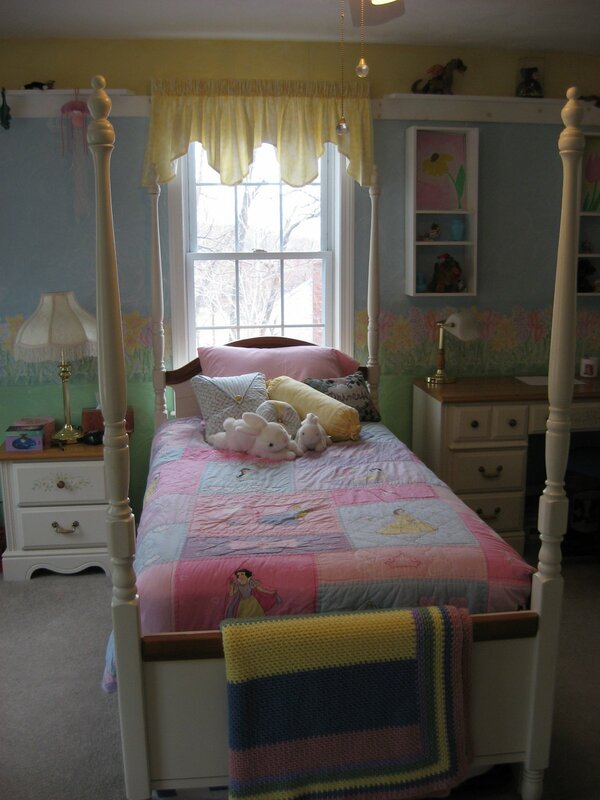 We had such fun fixing it up and making it her own, a room that any young girl would love to spend time in. From the corner opposite the doorway. From the corner by the closet. A bed fit for a princess. 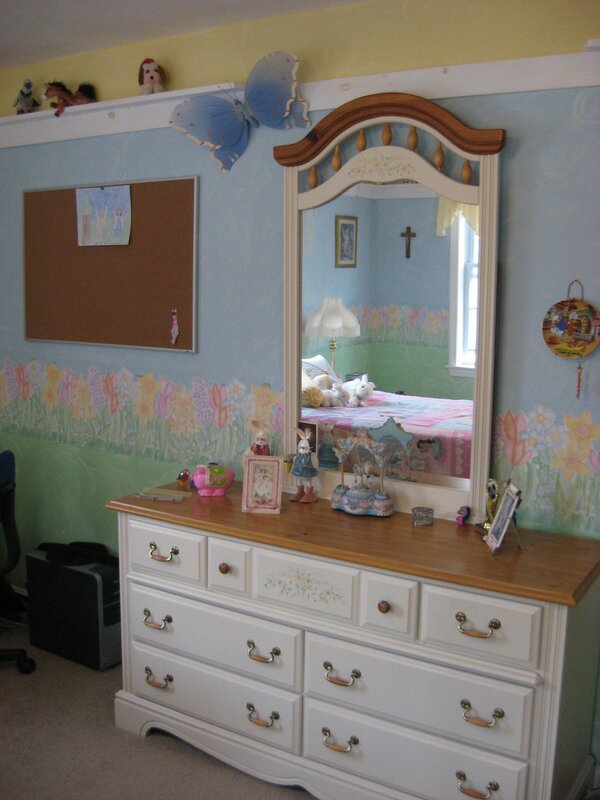 A dresser and bulletin board just waiting for Grace's personal touch. The perfect spot for a tea party with her American Girl doll! That little white cabinet hanging on the wall held bathroom supplies when I purchased it, but I tossed all of its contents and turned it into the perfect hanging wardrobe for doll clothes and hats and shoes and other little accessories! The towel bar on the bottom is perfect for hanging all the little clothes. Now just so you don't get the wrong idea, that I'm some kind of super woman who could paint and decorate a room like this in a week, besides all the cleaning out from one resident and moving in of another, let me just say that the painting and decorating of this room as it is now is exactly how it was done back in 2001. None of that has changed. And I hope it never does. 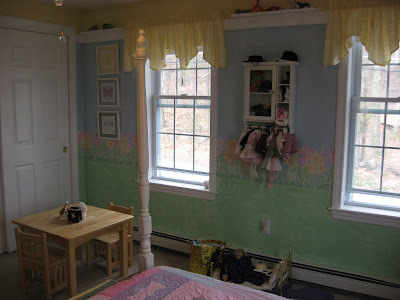 It is my very favorite room in the house as far as wall color and decorating goes! I just love it! It was fun to do too, and I did it all myself. The little white shelves that are around the room between the yellow and blue wall sections are made with pine 1 by 4s which I cut to fit flat on each section of the walls, then I added more 1 by 4s with mitered edges on top of the flat pieces and sticking out from the wall so that little toys and knick knacks could be displayed around the room. I know exactly when I was working on cutting all that wood too...it was September 11, 2001. I was in the house all by myself, working away on this project when my husband called from work and asked if I heard the news. He told me what was going on and I decided that I would wait until I stopped for lunch before I turned on the television. Not getting my work done was not going to change whatever was happening out there in the world. So at lunchtime, I fixed myself a sandwich and sat down in front of the television to see what was going on, something I never do on an ordinary day. But of course this was no ordinary day. It was hard to get back to my project after lunch, but I got it done, all the time wondering what had become of this world. Well, at least this little bedroom was a happy and cheerful place for now. The curtains were made from fabric that we picked out even before choosing the wall colors and it matches perfectly. I also made a duvet cover from coordinating fabric, but Grace decided she wanted to keep using her Disney princess quilt instead, which is a good idea because I noticed the cover had faded a lot over the years when I took it down to wash it. But the pillows on the bed are the original decorative pillows I made from all the same fabrics as the curtains and the bed cover, and they still look pretty good. I also made the white box shelves over the desk for Elizabeth to display her artwork. She decided to leave those two pieces of art for Grace to enjoy since they fit so nicely in the shelves and she doesn't have room for them anyway! 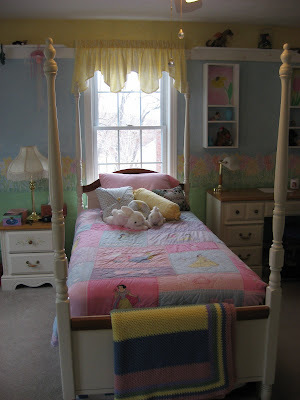 And the afghan hanging over the end of the bed is the one I crocheted for Grace a few years ago using one of my favorite crochet stitches for an afghan or baby blanket, the woven stitch. You can see my video tutorial for that stitch by clicking HERE, and make a cozy afghan like that for yourself! So that's what I've been up to here at home lately. Next time I'll show you a project I am doing for the school that my children attend. 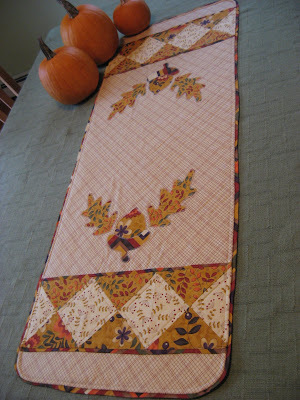 It's a quilty kind of project that I am thoroughly enjoying, when I have the time to work on it. I hope you have been productive lately too! 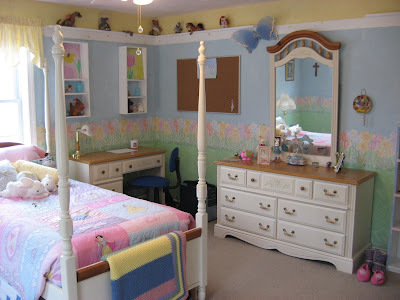 Wow Mary Grace...you outdid yourself...what a BEAUTIFUL little room...you should be so proud! Your children are so blessed to have such a creative and loving Mom! Grace must be so happy! The room is so sweet! I would love to do something like this in my grand daughters room. Thier mommy works full time and hardly has time to do something so special. And I love the idea you used the bathroom cabinet for. I think I will watch for one because I just bought my oldest daughter a 18 inch doll, not American Girl though I am going to use the patterns for those dolls and love how you hung them up. Where do you get the little hangers for the cloths? 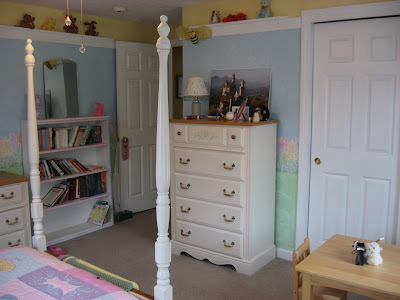 What a lucky little girl Grace is - I know she will be so proud of her new room. 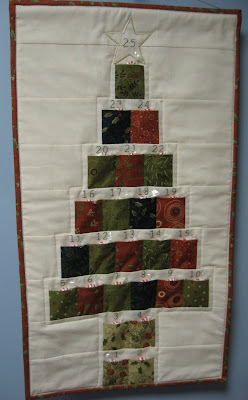 I am impressed with your color choices and the wonderful job of painting - you are most certainly a multi-talented lady!! Beautiful room for a little girl! She will have many happy memories in this room. A perfect place for a tea party! Very pretty and girlie.